Here a comparison the various types of photovoltaic based systems shall be shown, particularly grid-tied solar systems, grid-tied solar system with battery backup, grid-tied system with generator backup, and off-grid solar power systems. So Which Type of System is the Best for me? This all depends on what your goals are. For the best return on investment, a standard grid-tied system is best. If you want a good investment and peace of mind in the event of a power grid failure, then a grid-tied system with backup makes sense. If you live in a remote area with no local utility power available, then an off-grid system is your only option. Why is the Return on Investment so Small for an Off-Grid System? Off-grid photovoltaic systems utilize a large number of batteries to store energy for around the clock use. These large batteries are expensive, and must be replaced every 5-10 years. 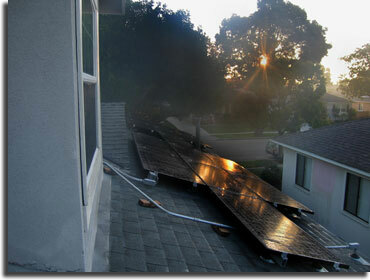 This extra cost raises the amount of money you are spending per kilowatt-hour that you produce. In some cases the cost will exceed that which the utility company would charge for electricity. However, if you live in a very remote area that does not have local transmission lines, you would have to pay the utility company to install them, which could far outweigh the cost of an off-grid solar power system. Not to mention the environmental benefit of using clean renewable solar energy!